What Is Mailbox All About? Earlier this month, fellow InfoSpace blogger Anne Marie Suchanek and myself posted a debate about the newest app to take the mobile world by storm: Mailbox. The new iOS email client was released to hype and fanfair, promising to revolutionize the way we approach email. Anne Marie and I took differing stances on the app during its initial release period. Due to its reliance on servers in the cloud, Mailbox (still) has a lengthy waiting list in order to gain access, allowing the app to scale effectively. While I initially predicted great success for the forward thinking app, Anne Marie proceeded with caution, arguing that the long wait times and reliance on the cloud would lead to unintended difficulties for the new app. Having signed up for a spot in line during Mailbox’s pre-release PR push, I have now had access to the new app for a little more than a week. Below, I expand upon our initial predictions and review the app in full. 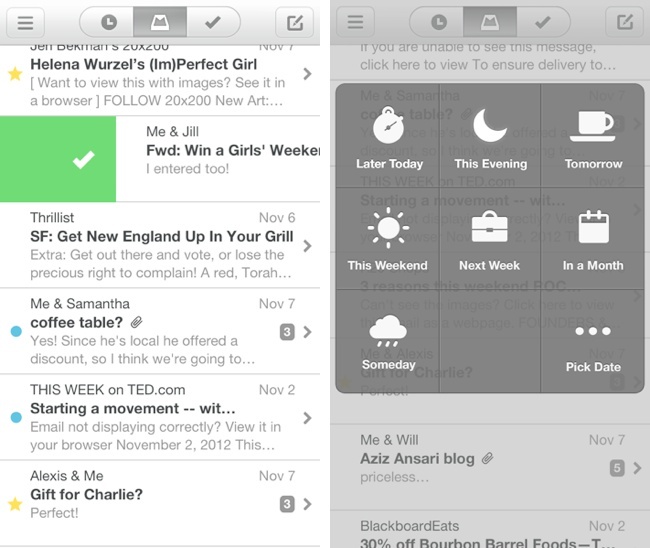 At the core of Mailbox is an approach that transcends the status quo of email. While traditionally we approach email as a communication medium, Orchestra, Inc. (the company that developed the new app) believes that “people use email as a (terrible) to-do list.” This train of thought definitely resonates with the way we use email today. Rather than just to communicate, email is also used to schedule tasks and organize meetings. In addition, I personally use my inbox to remind myself about important events or other obligations. This central tenant is the foundation for Mailbox’s “Inbox Zero” attitude. The app is built around taking care of email right away. Users have three main options for every message: to sort it into a list, to archive the message, or to save it for later. The ability to save messages for later integrates into a quasi to-do app-within-an-app. In addition, Mailbox focuses around conversations, not individual emails. Emails are structured in a sleek, chat-like interface that makes it easy to follow long email chains that often result in business settings. By default, your goal with Mailbox is to reach zero, having addressed and relegated all conversations to their proper place. Thus, app badges display not how many unread emails one has, but the number of conversations sitting unattended in the inbox. Orchestra has further enhanced Mailbox’s approach to email organization with a sleek, intuitive app design. Interacting with the app is built entirely around swipe and touch gestures: one-handed control of email is now a possibility. Furthermore, these gestures become very intuitive after a day or so of use. When now trying to use iOS’s default Mail app, I find myself trying to swipe an email into a list, to no avail. The app is also beautifully designed. Unlike many email apps that compliment a utilitarian function with an equally utilitarian application, Mailbox is gorgeous. Add in the well-organized layout and chat-like features, and Mailbox presents some top-notch eye candy. And if sleek and intuitive sound too good to be true together, Mailbox is also extremely fast. The reliance on servers for the grunt work clearly shows through in an app that feels lightweight and responds instantaneously to user input. After using Mailbox for a few days, Mail on the iPhone seemed to lag behind. Mailbox, however, is not without its faults. For one, the app’s reliance on the cloud to process, compress, and send email to the user has its own quirks. At least in my use, messages tend to arrive in chunks and are sometimes delayed. While this has yet to present any major issues, some users may desire more expediency. In addition, for half a day when I first gained access to the app, Mailbox’s servers went down, rendering the app useless. The Mailbox team responded to the issue with grace, effectively reaching out to customers via Twitter and quickly patching the issue. Yet, this instance reveals the common worries about reliance on remote cloud servers, as Anne Marie originally suggested. In addition, this event could easily justify Mailbox’s wait list for the needed purpose of scaling. And finally, Mailbox currently only works with Gmail accounts. I have long used Gmail primarily, and even link a Microsoft Exchange account to my Gmail inbox. Thus, this fact never posed a major limitation. Yet, users without Gmail accounts will find another access barrier when first using Mailbox. In my experience, it seems as though more people are excited that the wait for the app is over rather than the efficiency of the app. People are sharing their place online via social media sites, but seldom share their experience of the app. Furthermore, the retention rate the app has is still unknown to me. The beautiful design of the app seems to grab the attention of many right away (and people are vocal about it! ), but the dependency on the cloud can be as frustrating as it is advantageous. I haven’t heard enough feedback of the app to come to expect something of the app. If people shared as much about their reactions of the app rather than their feelings of anxiety to finally receive an invite to the app, my expectations for the app would be much different. I’m now behind 211,000 people in line, and the excitement for the app has greatly declined. I went from feelings of excitement to frustration to apathy. While Billy has covered the drawbacks and advantages of the app, I doubt I’ll stay with the app. The inability to use more than Gmail also bothers me. I am also so used to handling my inbox a certain way that I’m so hesitant to change. I’m still excited to experience the app for myself, but am doubtful of whether or not I’ll be a faithful user. After using Mailbox as my primary email app of choice for over a week, I stand by my original statement: Mailbox is most definitely worth the wait. The app’s sleek design, overall speed, and sheer intuitiveness all compensate for any drawbacks I have encountered thus far. Specifically, the deal-with-it-now approach to email has clearly thinned out my inbox and made me deal with emails more efficiently. In addition, I feel as if I do not even fully appreciate all of the primary features. I do not schedule many of my emails, but I believe this feature would be a welcome addition for professionals overloaded with incoming messages. Mailbox may not win over every user. Its reliance on the server and its limitation to Gmail may very well displease some. Others still may not embrace the design approaches that I find so welcoming. Yet, I believe that Mailbox will most definitely meet expectations for many users. So grab the app and jump in line, because you have nothing to lose by waiting! Has your Mailbox reservation been filled? What are your impression of the app? Is it a keeper? Share in the comments below.